NubianFlix™ joins the #BlackPantherChallenge movement to send Brooklyn children to see Black Panther. Initially started by Frederick Joseph for Harlem children, it began to spread throughout the country when Fred challenged others to do the challenge too. The Brooklyn campaign being, spearheaded by Pearl Fields of NubianFlix™ & Anthony Lockett-Larsen has managed to raise $2,574 of their $10,000 goal & will be providing tickets to children in Walt Whitman middle school & Children of Promise NYC. Brooklyn, NY, February 14, 2018 --(PR.com)-- Initially started by Frederick Joseph to take Harlem children to see Black Panther his campaign, which raised over $40,000, began to spread throughout the country as Frederick challenged others to do the same and help children in their neighborhoods by starting their own #BlackPantherChallenge. The Brooklyn campaign being, spearheaded by Pearl Fields of NubianFlix™ and Anthony Lockett-Larsen has managed to raise $2,574 of their $10,000 goal and will be providing tickets to children in Walt Whitman middle school, Children of Promise NYC, and the Sierra House of East Orange, NJ. NubianFlix™ is a brand-new streaming service that will be launching in beta in a few months. It will feature works that are created by, feature, and/or target members of the African Diaspora and is currently accepting submissions via their website at www.nubianflix.com. 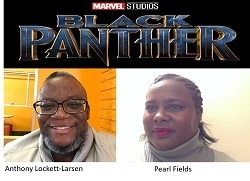 Even though the company has not officially launched yet, Pearl felt it was important to get involved with the Black Panther challenge because “it is very important for children to see positive reflections of themselves on the screen.” This movie is an historic event and is already breaking records before its official release and she feel it is wonderful that they will have the chance to be a part of history in the making by providing these underserved children a chance to experience the movie this weekend when it is released. The children will have their own red-carpet experience at the first screening for Brooklyn on February 17 at the UA Court Street downtown Brooklyn. If Pearl and Anthony can reach their goal then they will be able to do two more screenings with one of them occurring in New Jersey for the East Orange children. There is still time to support the campaign, if you would like to contribute you can go to their page here gf.me/u/gr98f3 and show them your support.